September means many things in our house. Kids are back to school, and the garden is transitioning into a new set of fall crops and being nourished with cover crops. But one of the best things about September is the abundance of fresh apples from the orchard. Our orchard is still too young to produce apples, however, we are lucky enough to have a local orchard within 15 minutes of our home. So as I was driving home from work this week, I decided to stop and pick up my first bushel of apples with the goal to make applesauce. 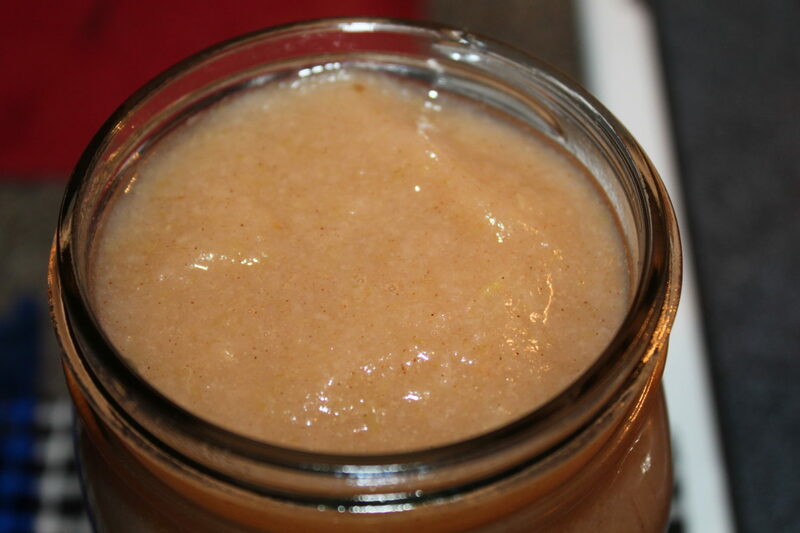 I remember the days when the kids were little, that applesauce was a staple in our house. We packed it in their lunches, ate it for dinner, and even added it to several recipes instead of using oil. At least we knew that we weren’t adding High Fructose Corn Syrup and white sugar to our diet. If you use the right mixture of sweet apples, there is no need to add any sugar to make the perfect sauce. 1. You must choose the correct mixture of apples. That’s right – mixture is the key! Making applesauce with a variety of sweet apples will add the depth of flavor that you are looking for, without adding any sugar. And don’t think of throwing those Granny Smith apples in the mix – although we all love to bake with these, they need to stay out of the applesauce mixture. 2. Do yourself a favor, and buy ‘seconds’ if you can. Seconds are the apples that are either misshapen or damaged, which aren’t prime for raw eating. However, they make great apples for sauce or apple butter, at usually 1/2 or 1/3rd of the cost. Sometimes you have to ask for seconds – they may keep them in the back room, but are quite a bargain! 3. If you plan on doing any canning, invest in a food mill of some sort. The time that it will save you is well worth the cost! We have both a Foley Food Mill and a Roma Food Strainer and Sauce Maker. Both have been essential in our kitchen! If you are just making a small batch for dinner – skip the food mill and take the extra time to peel your apples before throwing them in the pot to cook down and then use a potato masher to make chunkier apple sauce. 4. The lemon juice/citric acid debate — I prefer not to add either of these to our applesauce. It tastes and preserves well without them! And most importantly, it isn’t necessary. Remove air bubbles on the inside of the jar with a plastic utensil before sealing it with the lid. 5. When canning apple sauce, be sure to get any air bubbles out of the jar by running a plastic utensil down the inside of your jars. This will stop any air being trapped in the jars, expanding, and eventually continuing the oxidation process. 6. When your water bath is finished, remove your canner from the heat source and allow the applesauce to cool for 10-15 minutes in the hot, but not boiling water. 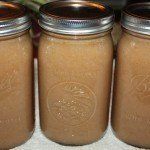 This will allow time for the applesauce to cool more slowly and condense without producing excessive air pockets at the top of your jars, thus decreasing the risk of excessive oxidation. So with that said, here are the simple instructions on how to make and for canning apple sauce. Using an apple corer/slicer saves a ton of time when making applesauce! 1. Core and cut your apples. Leave the skin intact but cut off any bad spots. This is where an apple corer/slicer comes in handy — makes it very quick to fill your pot. 2. Fill the bottom of your pot with one inch of water, add a lid and bring to a boil. 3. Once the water begins to boil, stir, reduce heat to medium and let the apples soften for approximately an hour. (The lid should remain on during the heating process). Stir occasionally to prevent burning. 4. Once apples are soft, remove from heat. Foley food mill being used to make the applesauce and remove the skins. **Hint – if there is a lot of extra liquid, remove the liquid to prevent your applesauce from being too runny. Save the juice to be used in later recipes. 6. Add cinnamon to taste and return to a light simmer. 7. Add to sterilized and heated quart jars. Place a warm lid and ring on the jar and place into your canner. Water bath jars by placing water at least one inch above the tops of the jars and wait until the water begins to boil. Boil for 20 minutes. 8. Once your time is up, remove canner from the heat source and let the jars sit in the warm water for 10-15 minutes. 9. Remove jars and let cool on a towel in a cool place, away from drafts. You should begin to hear that wonderful ‘POP’ sound of the jars sealing. Let cool for 24 hours – then check by pushing down on the lids to make sure the jars have sealed. If you can not press in the lid, store in a cool dark place for up to a year. If the jar did not seal properly, immediately place in the refrigerator and eat within 4 weeks. **If you would like to receive our Recipe Of The Week each Friday – be sure to sign up to follow the blog via email in the right had column, “like” us on the Facebook, or follow us on Twitter. This post may contain affiliate links. 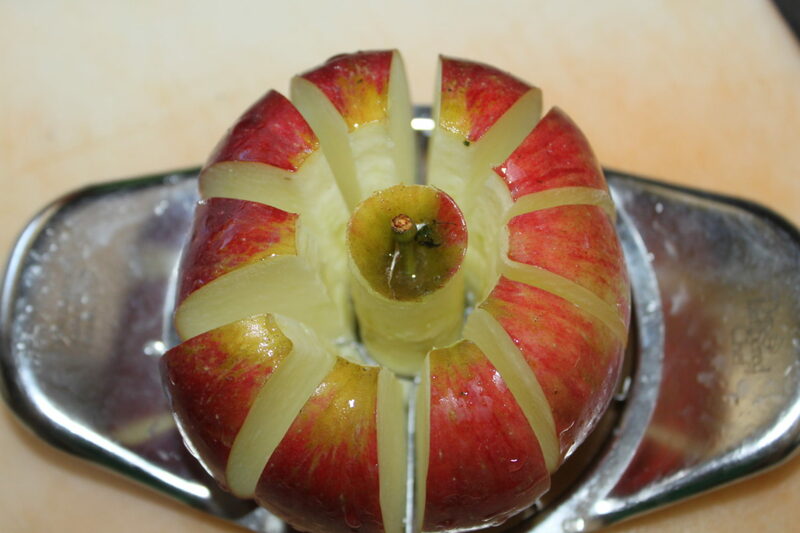 Core and cut your apples. Leave the skin intact but cut off any bad spots. This is where an apple corer/slicer comes in handy -- makes it very quick to fill your pot. Fill the bottom of your pot with one inch of water, add a lid and bring to a boil. Once the water begins to boil, stir, reduce heat to medium and let the apples soften for approximately an hour. (The lid should remain on during the heating process). Stir occasionally to prevent burning. Once apples are soft, remove from heat. 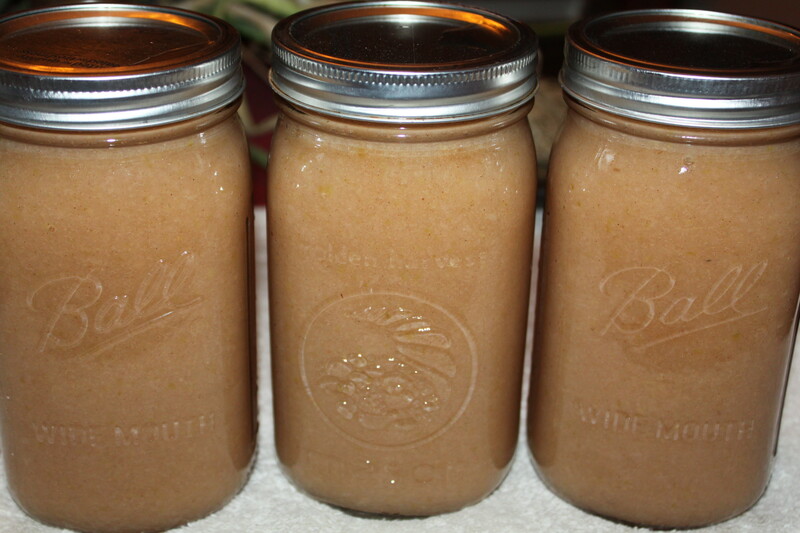 **Hint - if there is a lot of extra liquid, remove the liquid to prevent your applesauce from being too runny. Save the juice to be used in later recipes. Add cinnamon to taste and return to a light simmer. Add to sterilized and heated quart jars. Place a warm lid and ring on the jar and place into your canner. Water bath jars by placing water at least one inch above the tops of the jars and wait until the water begins to boil. Boil for 20 minutes. Once your time is up, remove canner from the heat source and let the jars sit in the warm water for 10-15 minutes. Remove jars and let cool on a towel in a cool place, away from drafts. You should begin to hear that wonderful 'POP' sound of the jars sealing. Let cool for 24 hours - then check by pushing down on the lids to make sure the jars have sealed. If you can not press in the lid, store in a cool dark place for up to a year. If the jar did not seal properly, immediately place in the refrigerator and eat within 4 weeks. ← Cover Crops Basics – What Are They – And How And Why To Use Them For A Great Garden! 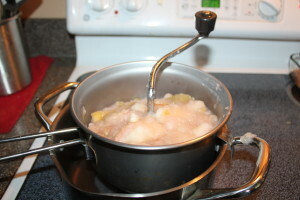 If I want chunky sauce and have a apple cider that peels and slices, can I do that a just mash with a potato masher?